Are you looking for a protein blender? This here is your definitive guide to buying the best blender for protein shakes out there. Studies have shown that exercise can help your body in dozens, if not hundredths, of ways: It can strengthen your bones, improve your cardiac health, lower your blood pressure, help you maintain a healthy weight and even improve your mental health, amongst other things. Coupled with the right diet, these benefits are much more noticeable, paving the road to a healthier, more enjoyable life. 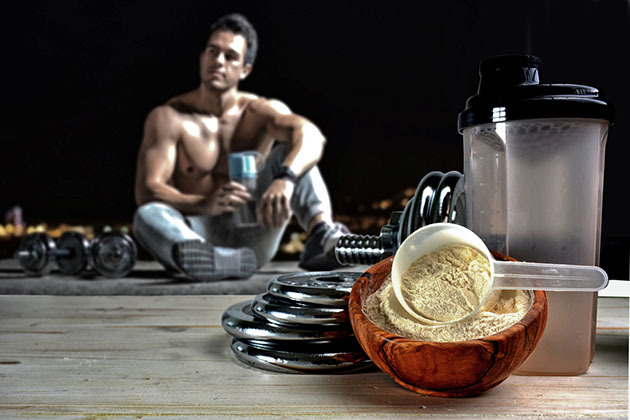 Of course, the right diet takes time and effort and in today’s busy world, it might be a bit too much for some, which is one of the reasons why protein shakes are so popular. There are many reasons why people drink protein shakes: Introducing more protein to their diets to reach their macros; replacing meals to eat less calories / for convenience sake; restoring their energy levels after an intense workout, etc. Regardless of your reasons to drink protein shakes, it pays to have a good protein blender, which is why we’ve gone ahead and researched the best protein blenders out there. How To Choose The Best Blender For Protein Shakes? We’ve talked about the best protein blenders the market has to offer but that’s worth nothing if you don’t know exactly what you’re going to do with it and what kind of benefits you’re expecting to get from your blender. - What do I want to do with it? - Where do I drink my protein shakes? - How large are my protein shakes? - What ingredients do my protein shakes usually contain? Let’s talk about each point and its importance. 1. What do I want to do with it? 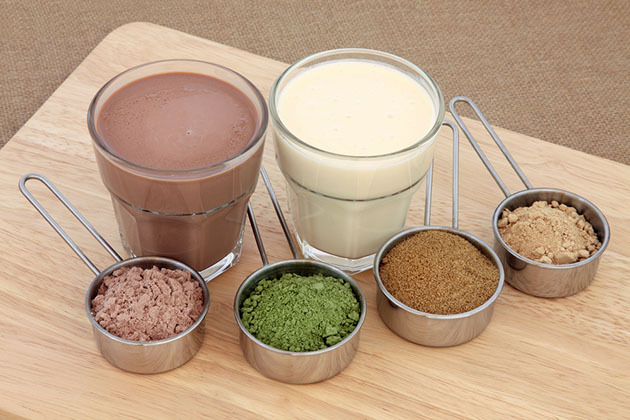 Protein blenders come in all shapes and forms: Some were created specifically with protein powder in mind while others can be used as regular blenders and can, coincidentally, blend protein. If you’re only interested in blending protein and nothing else, chances are you can get away with using certain vortex machines or even shakers, as you’ll only be dealing with protein powder. 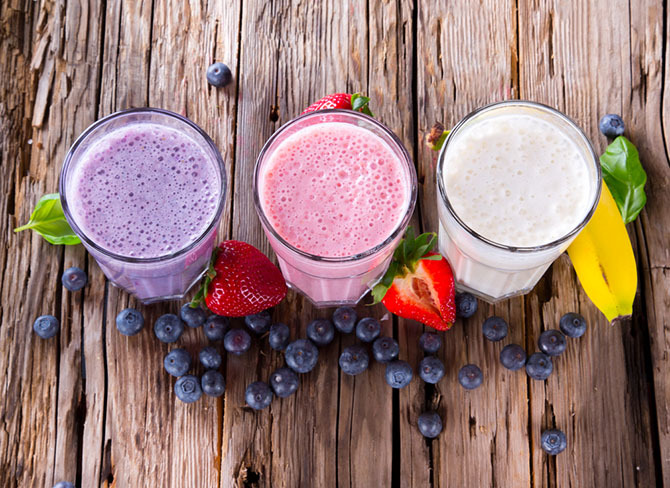 If, on the other hand, you want to get the most bang for your buck and give your protein blender as many uses as possible, you should get the more powerful protein blenders that can also double as smoothie makers and food processors. When it comes to the later you should also take into consideration the number of cups or containers it carries, as well as its lids and different accessories. After all, a powerful motor capable of many uses isn’t all that good as a general kitchen appliance if it only has a too small or too narrow cup. 2. Where do I drink my protein shakes? Some protein blenders work with an electric cord, while others work with batteries. As you can imagine, corded blenders are far more powerful than battery operated ones, but aren’t portable. Sure, you might be able to carry the cup around, but a protein shake that’s been sitting for your entire workout doesn’t taste the same as one that’s just been made. If you enjoy drinking your protein shakes directly after a workout, a battery operated blender is a good idea. If you don’t mind waiting until you get home, then a corded blender is the best choice, if only for power’s sake. 3. How Large are My Protein Shakes? Protein blenders make creating protein shakes much easier, as you won’t have to go through the effort of shaking or stirring. This convenience gets thrown out of the window if the blender cups are too small for your needs, though, as you’ll end up blending your protein shakes in batches. This also applies if you happen to make protein shakes for more than one person. Sure, this might not be an important consideration if you’re planning on making single servings for yourself, but you should always take into consideration the size of your protein blenders before making any decisions. 4. What Ingredients do my Protein Shakes Usually Contain? If you’re the straightforward type of person who enjoys drinking their protein shakes plain, then this is a moot point for you, as any kind of protein blender will do the trick just fine. If you like experimenting and mixing your protein powder with other ingredients, such as fruits and grains, then this point is of vital importance. The coolest, most beautiful blender won’t do you a shred of good if it’s not powerful enough to blend other ingredients with your protein powder. This is even more important if you enjoy drinking your protein shakes as cold as possible, as many protein blenders, no matter the quality, have a hard time blending ice. And there you have it! Those are some of the considerations you need to keep in mind when choosing the perfect protein blender for you. Chances are you’ve already heard about this blender before, be it as a protein blender, a smoothie maker, a food processor or a miracle product that can solve all your woes in the kitchen. The NutriBullet might not be the miracle product people seem to believe it is but it’s a damn good protein blender, that’s for sure. 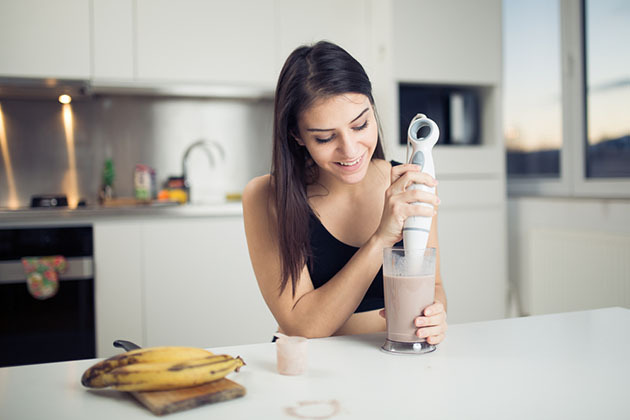 It boasts one of the most powerful motors of personal blenders out there –though the blender itself was still not designed to handle ice, so careful with that– and can help you make everything from a simple protein shake to actual almond milk. This blender comes with three containers, two small and a large one. One of the small ones even comes with a handle, making it perfect for drinking straight from it. However, nothing about the NutriBullet was designed with portability in mind, so the containers are large and clunky. This makes them easy to clean and makes it easy to put all kinds of ingredient inside them, but also makes them too large and clumsy for people with small hands. The biggest issue with the Nutribullet is the constant spilling, but rest assured this won’t happen as long as you don’t overfill it and make sure to close the lid tight. It’s worth mentioning that so many people report problems with spilling because “overfilling” in the nutribullet doesn’t mean filling the cup to the top. You can only fill the container a little above halfway to prevent any accidents, but since the containers are so wide it’s hardly a problem. This funny looking protein blender is one of the most peculiar you’ll find out there, as well as the most effective, which is why we’re leading our list with it. Its peculiar shape grants it a larger capacity than any other protein blender, up to 6 cups, which makes it perfect as a family blender as well. Unlike most protein blenders, this blender can actually blend ice, making it perfect for protein shakes, frappes, smoothies and more. The peculiar design of this blender means it can’t be used as a food processor or to grind coffee beans, as others in this list can. However, it allows you to easily add ingredients and it’s very easy to clean, so things do balance out. It’s also one of the easiest protein blenders to use, as there’s no need to turn the container or anything. You just throw in your ingredients, screw on the lid / motor and start blending! Powerful enough to blend ice. Can’t be used as a food processor. Can make a mess when removing the blades. We’ve talked about protein blenders that can be used as smoothie makers and even food processors but that’s not everyone’s cup of tea. 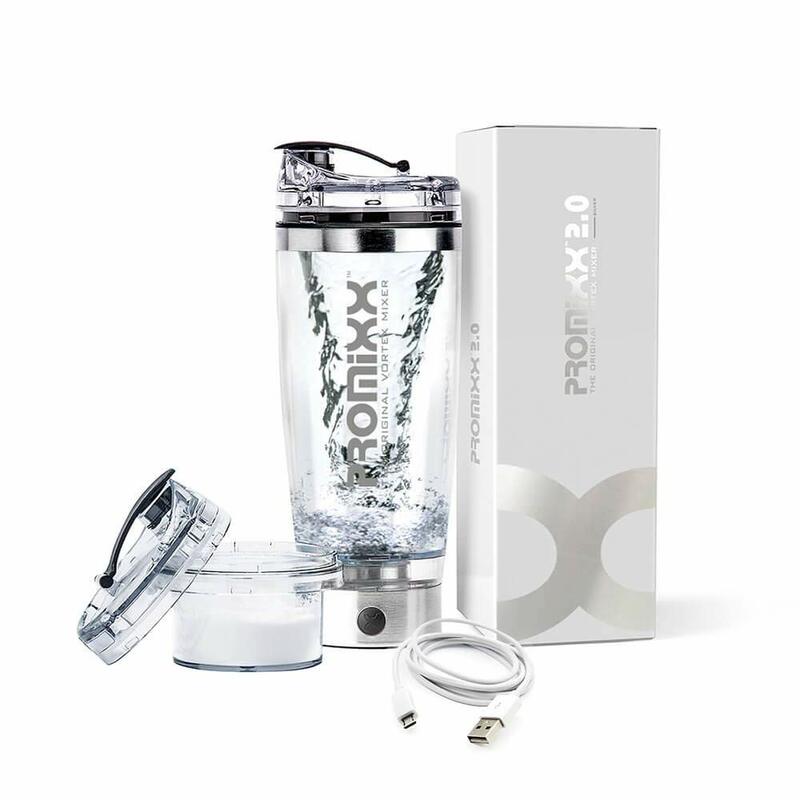 If what you’re looking for is a protein blender that handles nothing but protein, then the PROMiXX 2.0 is definitely what you’re after. It is now updated to recharge by USB connection! Available in many stylish colors, this blender is portable in every way imaginable, thanks not only to its design, which is a cup you can take with you anywhere, but also its powerful battery powered motor, which creates a vortex that blends your protein powder quickly and efficiently. All without needing to restrict yourself to a single location. There are some limitations you need to keep in mind, such as the fact that this is a mixer more than a blender and can’t do anything other than mix powder with liquids and you can really only make a single serving at a time. Still, if you’re looking for a protein blender and nothing else, this is the way to go, particularly if you’re the kind of person who enjoys freshly made protein shakes straight after, or even during, a workout. Again, keep in mind that this protein blender is more a mixer than anything else, which means that it will work wonders with powder and water but nothing else. Convenience is one of the reason people love protein shakes so much and this protein blender takes convenience to the next step. Powerful and versatile, the design of this blender makes it perfect for protein shakes, smoothies and even milkshakes. Not only because it allows plenty of room to blend all kinds of ingredients in it but also because you can take it with you. That’s right. The container is narrow, pretty and comes with a practical travel lid that transforms the Bravit from a protein blender to a perfectly functional water bottle. While the container allows for a lot of portability, there is a big downside to it and it’s the fact that the container is quite narrow, making it hard to introduce certain ingredients and even harder to wash. This isn’t a problem if you’re only planning on making protein shakes, but if you plan on making smoothies you’ll have to do some prep work beforehand. And if you’re planning on using this as a food processor? Well, the Bravit is certainly powerful enough to do it, but it might be a little hard to get the ingredients out of the container once you’ve ground them. While undoubtedly useful, this is the kind of blender that’s best saved for protein, smoothies and nothing else. We’ve covered protein blenders that you can take with you, protein blenders that can be used as smoothie makers and protein blenders that are designed with protein powder in mind. It’s time to cover something much more versatile and this 3-in-1 hand blender is exactly that. 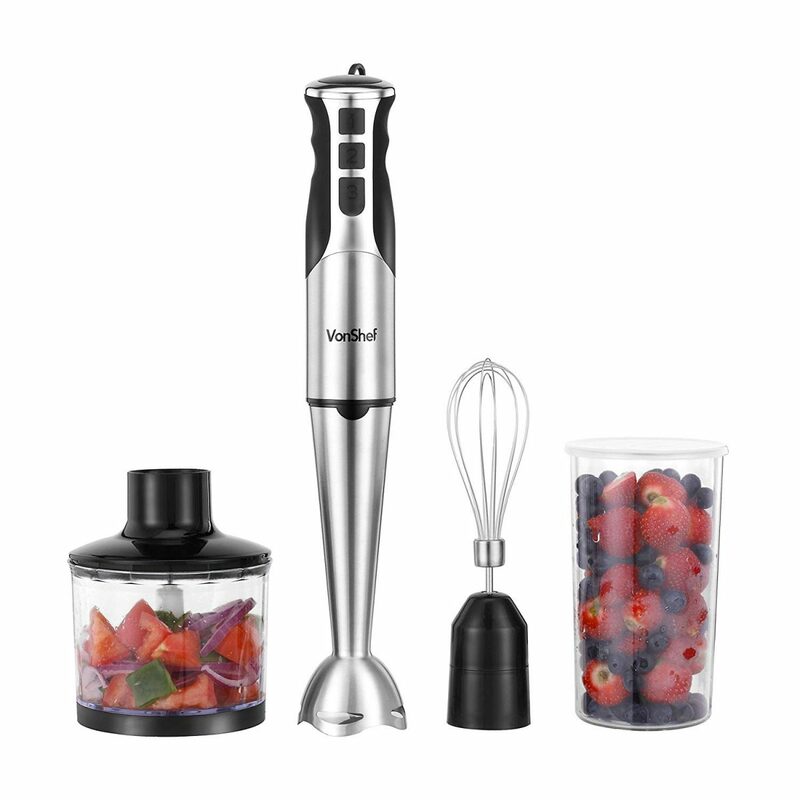 This powerful and useful blender can juice, grind, and blend, making it a great addition to any kitchen, regardless of what you’re planning of doing with it. It has a very powerful motor that can grind coffee beans, seeds and can blend crushed ice without a problem. However, although it is ergonomically designed, your hand may grow tired of holding it. I would not recommend it for anyone with arthritis. Not only that, but this blender comes packed full of accessories that will make it one of the best purchases ever, such as 17oz food processor bowl, 20oz beaker with lid, stainless steel egg whisk and stainless steel chopper blades.